Filed to: h.a.w.x.Filed to: h.a.w.x. Here's a nice little surprise, I may not be able to write about my hands-on time with Tom Clancy's H.A.W.X. quite yet, but I can post these screens that Ubisoft just sent out. Hit the jump to read the full fictional history of High Altitude Warefare and the H.A.W.X. experimental squadron. 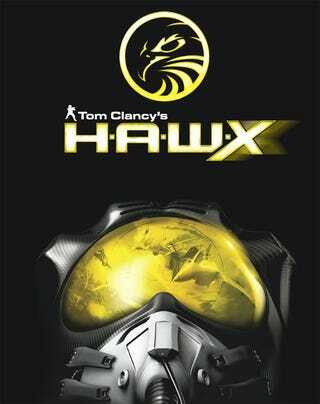 Tom Clancy's H.A.W.X "High Altitude Warfare – Experimental Squadron"
The "High Altitude Warfare – Experimental Squadron" (or H.A.W.X) traces its origins to 1943. In the midst of the Second World War, the United States initiated a program to acquire, evaluate and reverse-engineer enemy aircraft. Headquartered near Wright Field (now Wright-Patterson Air Force Base), it operated in conjunction with the OSS and the British Royal Air Force and was dubbed Project FALCO (Foreign Aircraft and Logistics Capture Operations). FALCO managed covert field operations teams in every major combat theater of the war. These teams were a maverick combination of engineers, linguists, enemy defectors – and of course, some of the Allies' most skilled and unorthodox combat-hardened pilots. As the war progressed, these aviators were frequently called up on by Allied High Command to put their skills to the test, using captured aircraft to insert covert agents and commando teams behind enemy lines and flying some of the most secret combat missions of the entire war. With the war drawing to a close, FALCO teams became involved in targeted efforts to obtain specific enemy technologies. Allied forces took custody of numerous Axis scientists, pilots and engineers, and captured a veritable treasure trove of advanced aircraft. In 1950, amid well-publicized USAF speculation that the enemy aircraft of WWII having given up their secrets, FALCO was officially ‘shut down' by the US Department of Defense. Except of course, it wasn't. With the realization that combat aviation was evolving into supersonic engagements at high altitudes with nuclear bombers and missile-armed interceptors, FALCO personnel, projects and facilities were simply re-organized into the ‘High Altitude Warfare' (H.A.W.) group. The squadron's elite fighter pilots are recruited from the most experienced and skilled combat veterans of the USAF, USN and USMC flight squadrons. The most highly-trained combat pilots in the world, they gain experience on all upcoming aircraft and weapon systems during the testing phase, helping refine designs and becoming the first to use them in combat should the nation require it. Capable of piloting virtually any aircraft from any branch of the US Military, in addition to many foreign designs, they are the 'top breed' of military pilots on Earth. 1) Testing and evaluation of the latest, most experimental and secret US and Allied aircraft and weapon systems, including piloted and unpiloted (UAV) high-altitude systems. 2) Combat or Recon missions based on national defense needs. H.A.W.X missions are generally considered 'black ops' and operational history is a closely guarded secret. The H.A.W.X squadron, thanks to their ability to pilot virtually any aircraft and access to the latest and most powerful aircraft and weapons, allow the US to have a clear 'edge' in air combat operations when needed. 3) As needs dictate (less frequently than the tasks listed above) the H.A.W.X squadron is involved with the training of US and Allied pilots and the capture and evaluation of enemy or non-allied air-oriented technologies. Most recently, with the changes in international dynamics due to the rise of the PMCs, the H.A.W.X squadron's unique skills are more in demand than ever before. For many years, state-sponsored militaries have struggled to maintain and modernize their forces. Increasing budget restrictions and difficulties in recruiting skilled personnel have led many countries to seek other solutions. More and more nations now rely increasingly on Private Military Contractors (PMC) – elite mercenary groups staffed with equally elite personnel - to support their field operations. PMCs have proven to be excellent partners in respect to efficiency, skills, low prices, and reliability. They've been able to fulfill most of the mission normally handled by regular armies, without risking political fallout. With each passing year, the PMCs expand their influence and scope of activity. Initially just consultants, they are now involved in surveillance, logistics, site security, and other essential roles. In order to keep the war machine going most of the PMC warranted firms dealing with other sources of income such as mining, oil extraction, airliners, goods manufacturing etc. Ensuring a steady flow of currency allowed these companies to operate a tighter game against their opposition. Each year, they come closer to serving as fully operational field units, and their services are so widely used they're already essential. Pandora's Box has been opened. There's no getting rid of the PMCs now. During the 2012-2018 timeline, the global military power will gradually shift toward the PMCs as they grow more and more independent from their high power self-governed contractors. From all the theatres of operations worldwide the South American episode was the main leverage of the PMC uprising. Near the end of 2016, before the arms threat would become obvious, the mere presence of these private contractors already had a negative impact on the economy of all the sovereign states, sapping their initiative and response capabilities.